Valentine’s Day will soon be upon us and we have assembled a thoughtful gift guide inspired by the highly bespoke service we offer. A picture frame can help mark the occasion and make it extra special. This particular gift guide relates strictly to suggestions for the lady in your life and will help provide you with an idea of how to pick the perfect customised gift for a loved one. A popular type of photo over many generations, polaroid’s can help capture that nostalgic feeling from bygone years. Why not frame your cherished polaroid’s in an eye catching picture frame that attracts the attention of all guests. We’ve put together a comprehensive table that outlines the print sizes for the most popular instant cameras..
We can’t cut frames sized less than 8.9cm (89mm). So if your polaroid picture is smaller than this you’ll need to make sure you order a mount with your frame. Perhaps you have kept a memento from your past together. A first plane ticket, or a token from a special holiday. Framing a keepsake like this can be a highly personal gift. Anything with sentimental value to you both is perfect for gifting. A popular first date option is the cinema, if only to avoid awkward silences as you get to know one another at a steady pace. If you still have the cinema tickets, or a poster from the movie why not get it framed? If you have visited one of the big music festivals in the UK or abroad why not frame your entry ticket or wristband? We suggest a frame and mount with a multi aperture which displays your favourite festival getaways from start to finish. Are you traditional romantics? Have you salvaged any love notes, or a simple post it note that really made you laugh, or cheered you up during a difficult day. Why not frame some of these moments? However, if you are on the younger side and don’t use pen or pencil for your messages, screengrabs of romantic WhatsApp’s could be a very 21st century idea. Perhaps you are one of the lucky couples who are well traveled and have explored interesting parts of the world together. 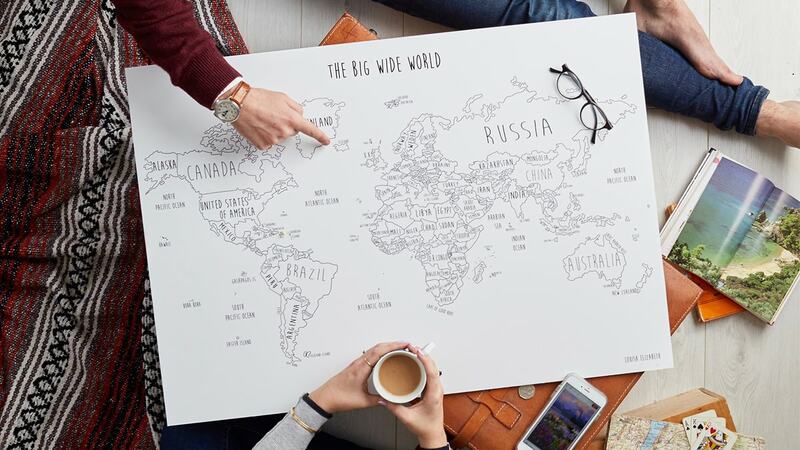 A framed map pinpointing places you have visited can be a wonderful callback to your adventures with one another. We absolutely love these by Louisa Elizabeth. The maps are dry-mounted onto foam board and framed ready for you to remember your special destinations. If you happen to be married, framing your wedding memories is a wonderful way to showcase your commitment to one another. Framing these is super easy to do and forms a permanent memento of your special day. Our wedding collection has a combination of white, silver and gold frame styles that our designers have handpicked. They’re perfect for framing your wedding bits. Similar to the more traditional couple’s photo, this can be a fun variation on the age-old format. The rising popularity of selfies means it’s unlikely you haven’t taken one during your time together! Frame your perfect selfie with our easy photo upload tool… Filters are optional! 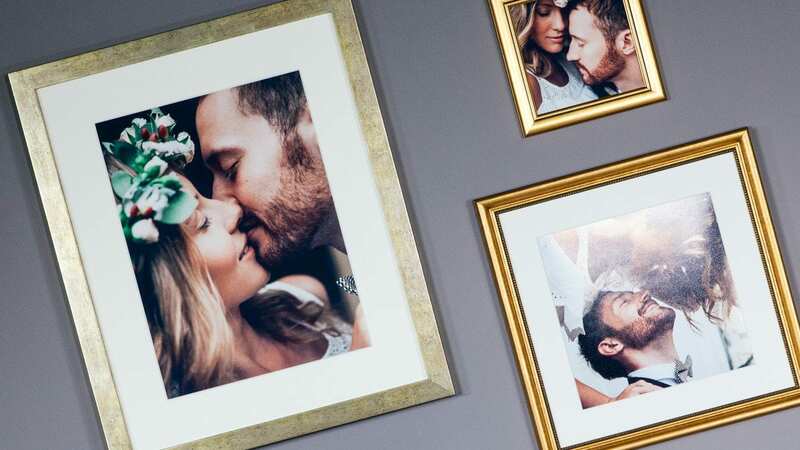 We honestly think selfies look amazing framed. To make sure you’re taking the best possible photos try these tips. The perfect way to tell your story, the gallery wall is a selection of picture frames displaying precious moments. A thoughtful gallery wall can be the perfect gift to tell your very own personal story, from the very first date, to the present day. Arguably the most the most simple idea of all, but one that will really stand out with the right frame. Upload a picture, customise your perfect picture frame, and pick a mount to make your special image pop. Staging this photo next to a cultural monument will provide that additional wow factor to your pose with one another. Inspiration for landmarks to catch within this photo could be but are not limited to the Eifel Tower in Paris, or the Grand Canyon in Arizona! This powerful image can be a real statement piece for your home.